As a convinced ‘fan’ of obscure, mystic, occult, ritual or just crazy Aural Art, I do whatever it takes - no, not whatever, yet at least quite a lot - to promote and support the (underground) scene. As an open-minded reviewer, I do write chronicles for new material, kindly offered to me by labels or bands / projects, but I do not mind, never at all, to spend my time on listening to, and writing about older material too. When a label or a band propose me to review an older recording, and in case I think it is worth spending my (valuable) time, I have no reason not to do so. Pfff… Quite a silly introduction, but this review deals with an older recording, initially released in 2015; yet since the fabulous German Pesttanz Klangschmiede label did send me this one (with some other, that have been reviewed in mean time, or that will have the honour to be reviewed by undersigned in a (near) future), and after having listened to this split several times, I am now, and so on, and so on. Die Verbrennung Des Himmels / Lobgesang Auf Die Natur compiles thirteen tracks created by two one-man armies. It was released in an edition of 500 copies on CD, including a four-page booklet that consists of the lyrics, twice im Deutsch. The split starts with seven newly written pieces by Brandenburg, Germany based Metamorph (formed in the earliest nineties as Disaster). During the nineties, Metamorph was a band that released some demonstrational recordings, but they did split up in at the end of last century. In 2008, founding member Tino ‘Wulfgar’ Thiele (also the mastermind behind, for example, Von.Troll, Feuermann, Die Nebel Der Entlosigkeit and, of course, Wulfgar; he also used to run the Ewig Records label in between 2007-2010) decided to reform, yet as sole member, permanently helped by session musicians. After some demos, he released a first split, together with Dutch act Tranendal (2010, Svartgalgh Records, very limited), and now, finally, there’s some new material available, released as Die Verbrennung Des Himmels (‘the combustion of Heaven’). Metamorph is ‘Misanthropie, Krieg, Dunkelheit und Teufel‘ (‘misanthropy, war, darkness and devil’), performing the sonic definition of 666. Their Black Metal is very melodic in essence, and especially guitar-based, yet with a huge important presentation of all rhythm instrumentation (bass and rhythm guitars, and drums). Within the mix, by the way, all are equally represented. The sound is ultimately raw, far away from a clinically polished production – indeed the only way possible. The somewhat primal compositions are power-driven, despite not being fast. The speed varies a lot, with both slower and more energetic parts, and everything in between, and especially the rhythm section gives that powerful attitude, that pounding, war-mongering evilness that typifies these seven elegies. The better part of the leads reminds me of the epic glory of the Nineties, paying tribute to the Old Gods without whom (etcetera). And last but not least a word on Wulfgar’s vocals: rusty barbwire, like a throat sadistically caressed by two-sided knife and gargled afterwards with boiling acid. Great outro too, by the way. Ad Maiorem Sathanae Gloriam! 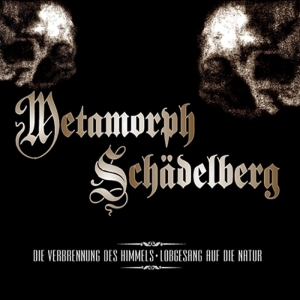 Track eight till thirteen are written and performed by Austria’s Schädelberg (‘skull mountain’). This project was formed in 2012 by Christcrusher after he stopped his activities as Kirchenbrand (‘church conflagration’) (formerly also active as Thy Nemesis). He worked with Wulfgar before as guest musician, by the way. Under the title Lobgesang Auf Die Natur (‘paean for nature’), Christcrusher brings tracks once compiled on the 2013-album Retro Ad Natura (‘back to nature’), which was originally independently released via digital sources. This stuff too has an epic feel, yet there’s more ‘pagan’ in both sound and execution. Schädelberg’s Black Metal is less organic in sound, and rather mechanical (drum computer??? ), despite the band’s message (‘Naturverbundenheit im Einklang mit Mutter Erde’ – ‘closeness to nature in harmony with Mother Earth’). But that, of course, has to do with the philosophy and not with the production. Bizarre (though…), yet impressive, are the electronic elements at the one hand, and the synth lines. The sound is ‘full’ with many layers, somewhat noisy and distorted as well, with an unbalanced mixture. The sulphuric throat and melodious lead guitars somewhat overpower the rhythm and bass guitars, and that’s a pity, I think. But it does not irritate either, to be honest. Anyway, the intention is cool (‘cool’, as in ‘groovy’, as well as in ‘icy’), and even characterising this guy’s vision and creativity. Harsher structures are often injected by more symphonic parts, atmospheric excerpts and epic chapters, maintaining the typical sound that defines the whole aural experience. Retro Ad Natura!